The Garden Flat is cosy, warm and comfortable. It's a self-contained apartment with a large, light and airy living / dining room, a well-designed European-style kitchen with modern appliances and a double bedroom with ensuite. The spacious living / dining room has an atrium-style roof, large windows and French doors giving access into the orchard and garden. All windows are double-glazed and there is a gas heater for the cooler weather. The cedar dining table seats four comfortably. Lounge seating includes a generous sofa, armchair and daybed. TV and free wifi are provided. The kitchen is equipped with fridge / freezer, European electric oven and microwave, and modern gas cooktop. Small appliances are provided. Tea and freshly ground gourmet coffee for the plunger are provided as is a litre of Tasmanian full-cream milk. If you would prefer 'lite' milk or soy, please let us know beforehand. If you would like to have some food in the apartment when you arrive, visit the Hill Street Grocer website. This is our local grocer and they have good food. If you order and pay online, we can pick up the order for you and put the cold items in the fridge so that everything is ready when you arrive. It would help us if you could arrange a pickup time for early the morning of your arrival. The bedroom has a very comfortable half-tester double bed with wool underlay and electric blanket, bedside tables and reading lamp. The ensuite has toilet, shower, hand basin, wall cupboard with mirror, and hair dryer. If requested, the daybed can be made up to accommodate an extra person. A folding cot and high chair are also available on request. All bed linen and towels are supplied. Outside the kitchen door a private, paved courtyard with a table and chairs make a pleasant place for outdoor use. Laundry facilities including iron and ironing board are provided. The apartment is below the main house and access is through the front garden and down a short flight of stone steps. Salamanca Place, home of the famous Saturday markets, and Constitution Dock and Kings Marina, where the Sydney-Hobart yachts tie up after the race, are 5km (10 minutes’ drive) away. Hobart’s CBD is a little closer, just 4km from the apartment. The State Cinema, one of the oldest cinemas in the world and a Hobart icon for good films, and good food and wine, is just 1.5km down the road at the start of the famous North Hobart restaurant and take-away strip. MONA, Australia's largest private museum and one of the most controversial private collections of modern art and antiquities, is 12 km, 20 minutes, by car or you can take a ferry from Brooke Street Pier near Salamanca Place. For bush lovers and mountain bikers, the apartment is just 500 metres from walking and mountain biking trails in Hobart's extensive Knocklofty bush reserve. 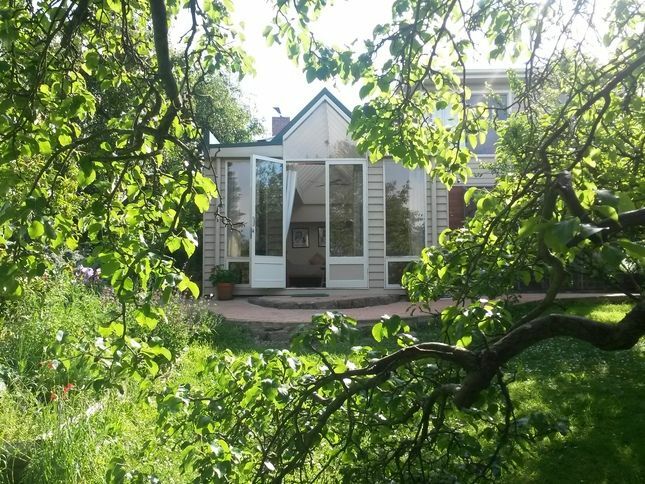 Gorgeous bushland offering stunning views through the trees of the city and the Derwent estuary. You will almost certainly encounter some wallabies unless there are dogs around. You may also be lucky enough to see potoroos and pademelons! The flat is a well laid out ground floor section of the owners' home but with a very private feel. The glass atrium in the lounge brings lots of light into the flat which looks out onto the back garden. Anne and Rupert were charming and friendly on arrival and departure and happy to help with advice if needed. The flat has everything you will need for your stay. Nearby hilltop streets provide a panorama over northern Hobart. Recommended. Really quaint home so quiet and comfortable great recharge of our batteries. Nice and quiet, clean and comfortable. Great outlook. We had 3 nights at the property and we had everything we needed. I wouldn't hesitate in staying again. The property felt very comfortable and peaceful. we needed. Unusually, it was 38 degrees on the Saturday of our stay. Apartment kept cool by evaporative cooler much appreciated. Extras like fresh flowers, ground coffee. Not a modern 5 star, but clean, quirky and lovely garden setting. Apartment was perfect for our needs and a lovely environment.